The Meeting dealt with summing up the activities of the Project which had been implemented in the TRACECA beneficiary countries since February 2009. The Project initiated considerable efforts directed towards improving aviation safety and air transport security in the TRACECA countries in compliance with international and European standards in the field of civil aviation. 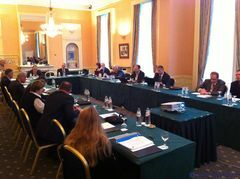 The Project actions were realized according to specific needs of the TRACECA countries in the field of civil aviation. Within the framework of the Agenda Mr. Louis Gerlin, Project Team-Leader submitted the Activity Report since the inception phase of the Project, the comparison with the original action plan, the project plan till the end of the Project, as well as the presentation of the subsequent project, its scope, similarities and differences between these projects. During the discussions and exchange of views of the beneficiary countries’ representatives there was held a round table on the issues of practical results and changes obtained in the course of the Project implementation in the beneficiary countries. The round table participants highly appreciated the Project activity regarding the implementation of major components of technical training, Project mobility and technical assistance in training national administrations for ICAO audits, in the field of environmental protection for the Project beneficiaries, the Project activity regarding the countries’ airlines blacklisted by the EU, as well as the Project efforts towards coordination of its activity with sector organizations and projects of mutual interest. Taking into account considerable and effective results of the Project, Mr. E. Biriucov, Secretary General of the PS IGC TRACECA expressed hope for the improvement of cooperation between the Permanent Secretariat and the Permanent Representations in the MLA TRACECA Parties and promotion of close coordination of activities within the framework of a new project on Civil Aviation Safety and Security scheduled for the beginning of 2012.